Once your Collage is finished you start finding Job, But to get Job there are some criteria and require your Information about your education, address and other Information about Candidate. The first thing that connect you with a recruiter is your resume. To create your CV or Resume their are some formate which should be followed. These tools will guide you to create your resume or CV. Create your CV Online and Download it in PDF Formate. LinkedIn is a social networking website for people in professional occupations,it is mainly used for professional networking. If you don’t have an Account on LinkedIn then register and get started to build your portfolio. 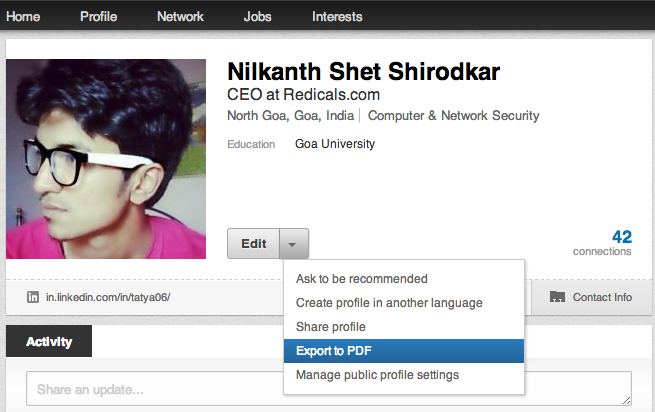 LinkedIn directly export your Information into resume in PDF formate. Just Goto your profile >> click on the down arrow next to ‘edit’ then select Export to PDF. Create and publish your resume online for free. Resume.com directly store your resume on cloud and you can also optimize it on google search so that whenever any one search you on google it will display your resume in search result. Step by step tools to build your resume in minutes and share it with employers. It’s easy to create a professional looking resume online. CREATE AN ELEGANT AND EFFECTIVE RESUME FOR FREE, you can design your resume to the color scheme there are many templates from which you can select any one and enter your Information and your resume is ready to go. The complete resume can then be downloaded in PDF or Word format. Online CV Generator automatically creates your cv without registration. You Need to feel your information manually The CV generator takes Your Basic Information, education, Jobs and your Skills. Fill all your true Information and simply save your CV in a PDF format. CV Maker Is very customizable editor which rearrange your Education, Work Experiences and Qualifications in proper manner. You also add your own sections to your resume and download the resume in PDF, HTML or TXT formats. LiveCareer is an tool to build your resume in an Professional manner. You can use many templates to create your CV. Once done you can easily print it or email it, also you can download it in different formats.